Funding cuts at our public schools have led to reduced resources, lower training budgets and fewer special programs. Teachers today are overwhelmed trying to meet the very different needs of children in their classrooms while working under limited allowances and goals of “teach to the test”. Few teachers, principals or administrators receive training to help them identify gifted children. When asked to identify gifted kids, many will select high achievers and those with good grades for consideration in gifted programs (if a gifted program exists). Are the school employees at fault? 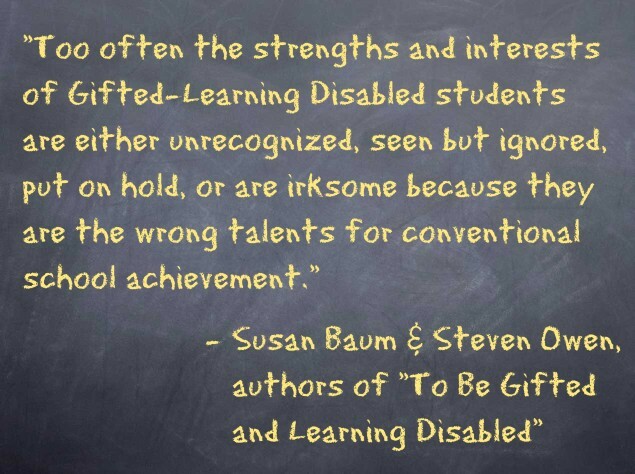 Most are simply not trained and instead apply the common stereotypical view of what they think gifted refers to. Many people believe that gifted children are well-dressed, bright eyed kids with their hands held high to answer the teacher’s questions. The kids who get the best grades must be gifted, right? Maybe some gifted children fit that description, but most do not. Gifted children are often bored in school and may choose to either become the class clown or become depressed by the lack of stimulation. They are often looked at as trouble makers or the kid who forgot to turn his homework in again. Identification of gifted children isn’t easy for trained professionals, let alone those without training. An even tougher challenge is identifying twice exceptional children. We start with a teacher who isn’t trained to recognize the traits of a gifted child. The teacher stands in front of 25- 30 students and observes them as he/she gives a lesson. Looking at the children, the teacher sees little Kalie in the front row who keeps raising her hand and answering questions. She knows Kalie has all A’s and is liked by her peers. Kalie dresses well and always looks clean and neat. Her papers are always legible and organized. Then the teacher glances to the back of the room where little Billy is tapping his feet repeatedly and fidgeting in his seat. Billy is wearing a pair of old loose fitting cotton pants with a cotton t-shirt that has a rip on one arm. Billy stands up and starts walking around the room for the third time that morning. The teacher is tired of being interrupted and tired of reminding Billy to stay seated. She has no idea that Billy thinks best when moving. She has no idea that Billy already mastered the topic she is discussing and has found several errors in her lecture. She has no idea that Billy has Sensory Processing Disorder (SPD) and is still trying to calm down from the last school bell that sent his body into fight or flight mode. She has no idea that Billy is dressed in the loose fitting ripped clothing because there are only a few things that he can wear that don’t make him feel like sandpaper is rubbing on his skin. She has no idea that Billy didn’t turn in his homework because he felt it was too easy and not worth his time. She has no idea that the last assignment he turned in was illegible because Billy struggles with fine motor control as a result of his SPD. The teacher sends Billy to the principal’s office again for not staying seated. Billy is humiliated in front of his peers, he is frustrated that he is being forced to sit still when his body says move, and he is disappointed that he is made to sit in a lesson that provides him no stimulation. That night the teacher sits down to fill out comments on report cards. Kalie receives outstanding comments that are all very positive and make her parents so proud. Billy receives negative comments that lead his parents to wonder what is “wrong” with their child. These comments and his parent’s obvious disappointment don’t help Billy with what he needs. We come to a divergent path. Billy’s parents may become angry and try harder to force Billy to conform to what they and the teacher believes is a “good student”. They may punish Billy when he doesn’t do as he is asked. This will without doubt amplify the already horrible situation Billy is dealing with at school. He may become alone with no ally in the world and sink into depression. Now let’s look at the other path that we hope is taken. Let’s suppose instead that Billy’s parents decide to speak with a medical professional to try to get answers for what is going on with their son. Pediatricians receive relatively little training on identifying children with uniquenesses and they spend a short amount of time with the child in the office. This makes it difficult for a pediatrician to accurately diagnose the problem in one visit. Some doctors will prescribe medication for ADD or ADHD and ‘see how it goes’. However, lucky parents will be referred for a full evaluation and really lucky parents may get insurance to cover it. The costs are high if insurance does not cover the evaluation and treatment. Even if insurance coverage is obtained, deductibles and co-pays may not be affordable. Sensory Processing Disorder is not recognized by most insurance as a covered diagnosis. Once again a crossroad emerges. Some may be able to afford the costs. We’ll talk about that later. Those who cannot afford the evaluation or treatment may attempt to leverage the school system to help their child. The school (if funding exists) will assess the child and provide some services to assist with the child’s special needs. OT and PT may be provided and special education classes will be offered. Sadly, most of our schools in the US don’t receive additional funding to help our gifted children. A child like Billy will be placed in special needs classes and given only part of the help he really requires to succeed. Now, let’s assume for a moment that Billy’s parents can afford an independent evaluation and that Billy undergoes a three day evaluation including an IQ test. Billy’s parents are told their child is highly gifted and has Sensory Processing Disorder. After reading a few books and trying to wrap their minds around all of the new information they are digesting, they feel somewhat relieved that they are finding answers and can help their son! Billy’s parents approach his teacher with the results. The teacher is open to listening, but is as overwhelmed by the information as Billy’s parents are. Having observed Billy in her class, it’s easier for her to accept that he has special needs and much harder for her to accept his giftedness. His behavior doesn’t demonstrate what she thinks ‘gifted’ is all about. She also wonders if Sensory Processing Disorder is real and doesn’t understand it well enough to relate it to Billy’s behaviors. She feels impatient listening to Billy’s parents and her mind is on the assignments she needs to grade from last week and the things she needs to get done before tomorrow’s class. She doesn’t know how she can possibly help Billy with no training and no special funding for gifted children. She suggests a special education program for Billy partly as a measure to move Billy out of her class and partly because she sees no other way to help him. Will special education help Billy? As already mentioned above, this will not provide a complete package for what Billy needs. Now, let’s pretend Billy’s parents have read enough books and joined enough support groups to know a little about advocating for their child. They try repeatedly to work with the teacher on ways to help their son. They suggest allowing Billy to sit on a large ball during class so he can receive the movement he craves; they suggest providing Billy with more challenging work; they suggest allowing Billy a number of other special accommodations to aide him with both of his uniquenesses. The teacher who is already feeling stressed over the upcoming standardized test and the need to ensure she prepares her students for it, is reluctant to further accommodate Billy. She knows she must concentrate on the students who perform well regularly if the test scores are to be impressive. The school Billy attends does not have funding for a gifted program and they are not trained in affordable accommodations for gifted children. Billy’s parents then call a meeting with the principle or school board or ask for an IEP meeting. The result is that the school will allow for some deviations, but are not equipped to fully support Billy’s special needs and giftedness. Without enrichment at school, Billy may become depressed and lose his passion for learning. Children may feel jealous or intimidated by Billy’s intellect and reject him as a friend. With accommodations such as a special chair, Billy may face bullying and relentless teasing for his differences. Billy may refuse special accommodations he needs in fear of social embarrassment or he may ‘dumb-down’ his intelligence to avoid ridicule. Over time he will sink deeper into his depression and lose himself in misery. If left in this situation, Billy will appear to future teachers to have even less potential with each passing year and his brilliant intellect will continue to be overlooked. What does Billy really need? He needs what every other child needs. He needs to feel comfortable. He needs to feel supported by the adults in his life. He needs to feel accepted by his peers. He needs his unique traits to be recognized, but not used to define him in a way that will exclude him. He needs intellectual peers who he can relate to and who accept him. He needs an environment at his school where he can learn and grow outside of a one-size-fits-all model. He needs a classroom without flickering florescent lights. He needs space between him and the other children so they don’t bump his desk. He needs a room where all kids sit on a special chair thus eliminating the ‘special’ aspect. He needs the freedom to work at his own pace. He needs the opportunity to work with other children who share his interests. He needs to feel like he belongs. He needs to feel “normal”. ← Welcome to Rochester SAGE! This is a superb piece of writing and I think that always expecting children to be perfect and the same as everyone else is the biggest problem. When I was a teaching student I used to love to do show and tell and knew the dreams and strengths of my class that didn’t necessarily relate to test results. By the time I left teaching twelve years later I couldn’t fit this type of activity in to the time table because I couldn’t justify it with learning objectives. There is too much emphasis on conformity and it is preventing teachers from adapting to the children and children finding their own place in the class. Also teachers don’t really get enough training at all – some ‘expert’ may come in and earn their money by clichés but you don’t get proper nitty gritty training unless you are a SENCO who then cascade it down to you via misinterpretations and misunderstanding – even if you could diagnose it there is not much you can do because OFSTED penalise you if children are taken out of class. Also some teachers and some children just can’t conform enough to get all of the boxes ticked – which is a shame because they would be well matched. I am so thankful to be in a school district (Fairfax County, VA) where there is funding for Advanced Academic Centers (formerly called GT Centers) and that we are in a school with an excellent principal, teachers, and counseling staff who are responsive to the divergent needs of all of the school’s students, gifted or not. I have two boys, each of which have attended the AAC, one who “fits the mold” of the stereotyped view of a gifted student, and another who would be classified as “twice gifted.” Thanks to supportive staff, and a 504 plan addressing his needs, he is beginning to thrive academically and socially without meds and without feeling overly “different.” Both of my boys benefitted from being in this stimulating, challenging, collaborative learning environment where moving around and talking about your ideas was an accepted and EXPECTED part of learning rather than sittting still and filling out worksheets. P.S. On my blog you will see posts about my son, and how we meet some of his sensory needs at home, in addition to many other great ideas for sensory exploration, fine motor skill building, and self-expression through art for all young children. This describes my son perfectly. According to his doctor, he had ADHD, but the meds just made him into a zombie. I had to choose to take him off of them early because they seemed to be making him sick. He also had dyslexia, and the teachers he got had no patience with his writing. He does his best thinking moving around. I wish I’d known about this when he was in school. I finally had to let him drop out…he was getting so frustrated and angry. Great article! The way you wrote it, by describing an active scenario and giving us moving pictures, makes 2e-ness easier to imagine and to comprehend. You describe my son, who has questionable diagnoses of ADHD and Aspergers (no one can really agree on what is really going on with him), and is also gifted. Thank you for the kind compliments on the article. As a parent of a 2E child the topic was certainly written from my heart. Alison- it’s always comforting to know we are not alone and other patents out there are navigating a similar path. Ace puppets -thank you for sharing your personal and first hand experience from in the classroom! It’s so important to hear the perspective of educators. Julie – it’s fantastic that your children have such a wonderful school environment! I hope one day all children do. I will be checking out your blog on SPD later today! Bird – I hope your son is finding his home education to be a better fit! Certainly he must feel much happier to be in an environment where he can be himself! Christine – DX is so tricky with 2E kids! We started out thinking my son had Aspergers and ended up with multiple DX’s none of which include Aspergers! It’s so tough for doctors, parents and teachers to separate the gray areas of trait overlap. We are in the middle of all this right now, having paid out the $1500 we couldn’t afford for the evaluation, that found she didn’t have ADHD but is gifted, except every other professional that’s read the report and the test results think she may have ADHD and be gifted. The old ‘she can’t have ADHD because she’s doing well in school’ is so infuriating. We had the IEP meeting yesterday and the only thing that came out of it was her being given a folder to organize her papers in. The school won’t differentiate beyond the pullout math and reading classes she’s already in, even though they admit they are not enough. Of course she is doing well right now, she doesn’t have to try. I’m upset that they’re only choosing to address the ADHD side of her problem, and ignoring the gifted situation because she’s performing to the level they need her to, instead of what she’s capable of. I have the same issue with my son. Sometimes I send him outside to run laps around the house just to work out his excess energy. His elementary and middle school teachers also weren’t able/willing to see that all gifted children don’t fit into the same box, and consequently he was miserable and gave up. Thankfully our county started an Early College High School program the year his older sister started high school – when he saw how the program worked, he applied the very next year – and was accepted. We’ve been lucky enough that the ECHS has attracted teachers who think outside of the box, and recognize that being “gifted” doesn’t have to equate with being “good” or “popular” or “sociable” and for the most part, his teachers have helped him work through his “energy bursts” and encouraged him in his work, his goals, and his dreams. If not for the staff at Stokes Early College High School, I’m not so sure he’d be doing as well academically – or be as happy – as he is right now. I have the same issue with my 9 year old son. I have been homeschooling him for the past year but really need to find a school for him to attend in the fall. It took us 2 years and 4 therapists and then finally an OT before we got an accurate dx. ADHD was thrown around as well as a few others before we finally learned he was gifted with SPD. His SPD is subtle so none discovered it until we had a full OT evaluation. I call my Billy “Xander”. And now, at the ripe old age of just-turned-eight, after two $1000+ testing sessions and three private schools recommending medication, I started homeschooling. My PG severely dyslexic SPD but NOT ADHD child learns everything I teach him as long as I keep it at the level he learns and not at the level he reads. Thank you so much for blogging our life….exactly. Whenever I am unsure….something like this comes along and validates me. You have done an excellent job of making the plight of the 2e child real. Parents of 2e children like myself can see our lives in this well-crafted piece of writing. Heathermcamp: Thank you for reblogging the article! Katherine Brown: It sounds like we are raising very similar children! I too feel so much better after reading articles where others have walked in my footsteps with their child. It’s so comforting to feel less isolated and to be refreshed and reassured by others. Linda: Thank you sincerely for the compliment. The twice exceptional Newsletter is one of my first and still favorite resources for special kids like ours. In many ways I felt you were writing about me. I would test into the gifted programs – but then because I was “anti-social” and failed to participate I’d be put back into the mainstream again, forgotten except as the “quiet little weird girl” until the next year’s tests. I just quit trying. I’ve battled for my children and made sure that what they don’t get out of public education they get at home (I’d homeschool but I have to work full time; I’d private school but who can afford it?) – some teachers over the years have thanked me for this; others have been rather annoyed with me as it puts my kids ahead of their peers in some subjects. I’m just thankful I found this blog – it’s wonderful to read about parents who understand that truly gifted children don’t fit inside the box! Jen – I’m so truly sorry that you’re daughter is in this position. Your experience is (unfortunately) too common. Have you read the book, “Misdiagnosis and Dual Diagnosis of Gifted Children and Adults” by Webb and other wonderful authors? Perhaps provide a copy to the principle/teacher and kindly request that they read it. I know that a few parents have sent my article to the principle/teachers/school administrators and it has started to open communication lines. Also, I know of a few parents who are working with the schools have their children do online courses during school in lieu of the regular curriculum for subjects that aren’t challenging enough for their children. Some are having their children work through Stanford’s Open Enrollment Program and others leverage Khan Academy (which is free). And some choose to homeschool or utilize one of the online free virtual public schools. I certainly hope your daughter’s school comes around and begins to recognize that children can be both gifted and have ADHD (or any other DX). Gifted children are certainly no more precluded from having a second DX such as ADHD then they are from having a cold. Thank you for this heart-felt, hopelessly honest, true-to-life account of what so many of us have gone through. This moved me so much I had to absorb it for a day before responding. It took my back to when my kids were little and we were just at the beginning of this 2E journey. My eldest is in high school, now, and it’s hard to believe how many years we’ve walked this path. For us, there has been some improvement, and an understanding gifted school has helped, but 2E life is still 2E life, mysterious and ever-changing. Thank you for shedding light on what we live and on how misunderstood and underserved we all- us and our kids- are. Keep helping people to know what 2E is and why it matters. Not all parents have the luxury of homeschooling their children. Sounds like tlp40 could use some compassion. My grandson is almost four. He has memorized all his presidents their wives, has read since he was two, calculates, rationalizes, knows his states and capitals, understands numbers into the thousands range, does adding, subtraction, etc, etc. He has all the Dombroski’s Theory of Sensitivities type behavior and is just a joy. He is overly dramatic, sensitive to music and many other things. We are in Rochester, NY and are starving for guidance in testing, schooling. My daughter has her masters in literacy and is amazing a teaching my grandson and our granddaughter, but we have come to the point of “more”. Any advice in the Rochester, NY Area? Gerald, Rochester SAGE based out of Rochester, MI, so I do not know the resources for New York. I recommend contacting Advocacy for Gifted And Talented Education (AGATE) in New York State. Their website is http://ecbiz111.inmotionhosting.com/~agaten5/ and may have information on Rochester, NY. Amy Quinn – anq1970@gmail.com – is their director of Chapters and Affiliates and may know of someone in the Rochester, NY. I hope you are able to find the right help for your grandson. Also, check out the education links at http://www.giftedinmichigan.com. Amy Simko, You described my son, Jacob, to a “T”. I was unable to locate your email address so I hope this message makes it to you,. These past two years have been extremely difficult for us. I decided to homeschool Jacob because staff generally did not understand how to work with him at his last school. We interviewed with a few schools and even tried a homeschooling group that prided themselves as being “progressive” as well. Sadly, we have yet to find a place where Jacob can get an education in a supportive environment. You are the first person who has shown me any depth of experience with children like Jacob. Jacob is a funny, sweet and exceptionally intelligent boy. Sadly, he is most often viewed as a difficult student because his sensory processing difficulties get in the way. I would greatly appreciate any advice you can offer to help me in locating a school for Jacob to attend next fall. In addition, I would love to connect with parents who have children like my son. Do you recommend a group? Thank you. Amy, I would like to share about our FB community, Twice Exceptional/ 2E Network International. We have a wonderful group of professionals to help support our parents and individuals. We have membership in 37 states and 27 countries so far. We also have a meet-up group for families in the Los Angeles area called Twice Exceptional/ 2E Network LA. We are here to support 2E families. Marcie Booth, Founder & Director: (818) 667-1950.